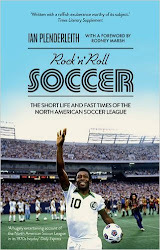 There are at least two reviews out on the internet whose authors are under the impression that 'Rock n Roll Soccer' was written by Rodney Marsh. Marsh, of course, wrote the foreword, and his name appears on the cover beneath my own. I don't have a problem with this. If people read the book and enjoyed it and thought it was written by one of the most prominent and colourful English footballers of the 1970s, who am I to complain? When I first received proof copies of 'RnRS' a year ago, my father-in-law happened to be visiting and was keen to read the book. As the foreword was not attributed to Marsh on the first page, at first he thought it was written by me. "It seemed a bit strange that you were making out you'd played in the NASL," he said, "and I was somewhat worried about your mental state." For the final print edition, we made it clear from the first page that the foreword consisted of Marsh's account of playing in the league, and not some flight of my imagination. And God knows, I've spent enough time in my life imagining myself as a paid footballer. From around my fifth birthday onwards, to varying degrees, until my tender hamstrings forced me into retirement last year at the age of 49. 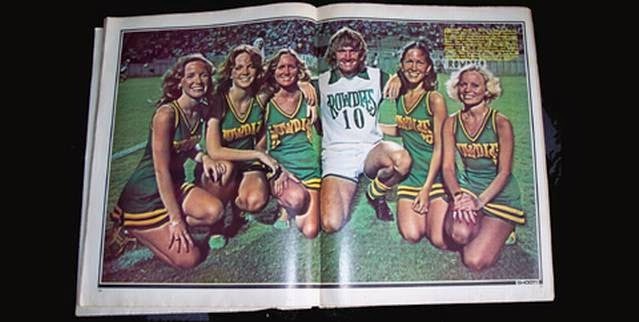 Me with some cheerleaders during the 1970s. "If dreams, as Shakespeare wrote, are nothing but 'the children of an idle brain, begot of nothing but vain fantasy', then I plead guilty. In sleep, I've often scored great goals in front of huge crowds. In waking hours, I've longed to play in a professional game, even for five minutes. Just to see what it's like. Just to say I've been there." Around a decade ago, when MLS started up its reserve league, I dreamt that I got called up to play for DC United's second string due to an injury crisis. I told my dream to Doug Hicks, who was the team's head of media relations at the time. "That's not gonna happen," he responded drily, as though just by telling him the dream, I'd been hinting that maybe it would, or at least that it could. Which of course was exactly why I'd told him. He was on to me. Hicks and his colleagues are, however, very switched on to the needs of writers and journalists in this respect. They know we're only carping from the press box because we're either too fat, slow, useless or old (or all four) to be out there ourselves. So during MLS Cup and the MLS All-Star Game they indulge us by taking the trouble to organise media games or tournaments. I've still got my lovely trophy from being on the winning team at the 2011 All-Star Media Challenge in New York. I played against Greg Lalas, who once played half a dozen games in MLS (albeit over a decade earlier). He didn't seem to be noticeably better or worse than the rest of us. See, man, I coulda been a contender. But that passage in Rock n Roll Soccer that goes: "In one game he [Pele] went ballistic at me for what he thought was showboating. In another game he scythed me down and provoked a 15-man brawl. Most painful of all, after I nutmegged him once he came up to me and ruffled my hair - a sporting gesture by the revered icon. Except that no one could see that he'd gouged my ear with his fingernail and opened up a bleeding wound..." - that was not written by me. I did not nutmeg Pele. That was Rodney Marsh. But if you want to confuse the two, be my guest.